These always have an interesting look ! - 100% natural Copper from Michigan in the USA. Copper has long been believed to help reduce swelling and inflammation and to relieve the symptoms of rheumatism and arthritis, indeed copper bangles and bracelets were worn by the Romans and probably date back to even earlier times too. Copper is also thought to be good for blood circulation and for treating cases of restlessness, fatigue and low energy. Copper works on our base and sacral charka points and promotes within us intuition, vitality, desire and sexual desire. It increases our energy levels and makes us more mentally agile. It encourages experimentation and inventiveness. It also helps us to draw inspiration from the natural world around us and to learn new things through observation. Copper allows us to become much more aware of our own unconscious thoughts and of how these thoughts may shape our emotions. It also allows us to see any obstacles standing in the way of our own future development. Copper helps us to realise that there is no need to constantly search for "the meaning of life" but that there is a need to release and remove all of the barriers that we ourselves have placed in the way of our own spiritual development. 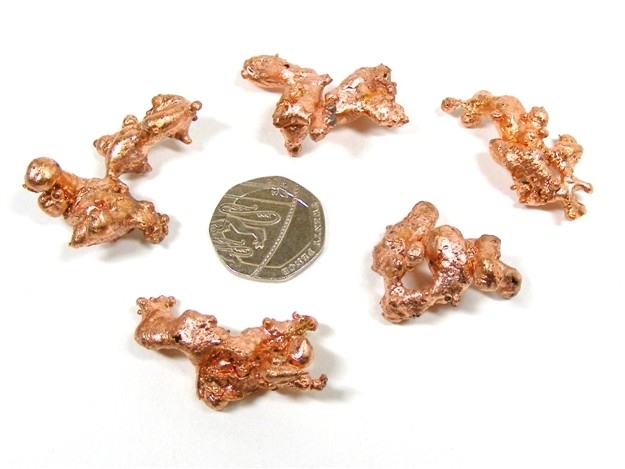 Copper is a great conductor of energy and is extremely useful for pulling in energies from the higher realms. It can provide a beneficial connection between the physical body and the astral body and can help to align the subtle bodies. It can bring positive energies into our aura and can also promote channeling and psychic contact.